Phanuel Soza trained at B.A.T. Art studio from 1996-1998. During this period He also sat forO and A level Cambridge examinations. At B.A.T. Art Studio Phanuel was introduced to drawing, painting, print making and sculptures. 1996: Young Artist Exhibitions Gallery Delta, Graphic Exhibitions Gallery Delta, Final Year Exhibitions National Gallery Zimbabwe. 1997: Young Artist Exhibitions National Gallery Zimbabwe, Final Year Exhibitions National Gallery Zimbabwe, National Zimbabwe Heritage National Gallery Zimbabwe, Group Exhibitions South Africa. 1998: Young Artist Exhibition Gallery Delta, Graphic Exhibitions Gallery Delta, Biannual National Zimbabwe Heritage National Gallery Zimbabwe, Group Exhibitions Verandah, Group Exhibitions Innerspace, Zimbabwe Heritage Bulawayo National Gallery, Award of Merit Zimbabwe Biannual National Heritage. 1999: Young Artist Gallery Delta, Group Exhibitions Verandah, Group Exhibitions Innerspace. 2000: Group Exhibitions France, Group Exhibitions USA. 2001: Group Exhibitions Veranda, Group Exhibitions Mukuvusi Woodlands, Group Exhibitions Borrowdale. 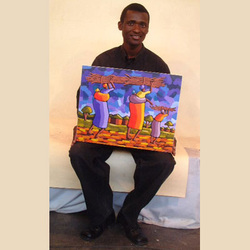 2002: Group Exhibitions National National Gallery Zimbabwe, Group Exhibition Delta Gallery, Group Exhibition Verandah.